It seems we living the American dream but the people highest up got the lowest self-esteem. The prettiest people do the ugliest things on the road to riches and diamond rings. We shine because they hate us, floss ’cause they degrade us. We trying to buy back our 40 acres. And for that paper, look how low we gon’ stoop: even if you in a Benz you still a n**** in a coupe. . . . We buy our way out of jail but we can’t buy freedom. We’ll buy a lot of clothes when we don’t really need ’em—things we buy to cover up what’s inside: ’Cause they made us hate ourselves and love they wealth, that’s why shorties holla “where the ballers at?” Drug dealer buy Jordans, crackhead buy crack—and a white man get paid offa all of that. He was really into girls, music, and black liberation as a shorty. . . . We looked at rappers like these dudes are entrepreneurs, they not working a 9–5, they not punching nobody clock. . . . It’s hilarious when I hear people say “Kanye is in the illuminati.” No, Kanye applied himself. When we would be out chasing hoes, there was times Kanye would be with us, but a majority of the time he’d be in his bedroom making beats with the same clothes on for days, no haircut or nothing. That dude was focused since he was a shorty because he knew what he wanted to do. . . .
Notice how West has always tied these values (hard work, grit, ambition)—associated most strongly with conservatism—to black emancipation. The idea seems to be that one must start by taking control over what can be controlled, leveraging the resources one has at one’s own disposal first, in order to effectively transform oneself, one’s community, and the larger society. Drawing on these themes, in 2011 West dedicated an entire track to the subject of black-on-black murder (a topic generally perceived as taboo in polite liberal company) and issued a call to “redefine black power” (“Murder to Excellence,” Watch the Throne). Ye has consistently insisted that people dwell too much on memories and history—obscuring the possibilities available to us here and now. To drive this point home, in much the same way that many (Kanye included) have attempt to reclaim the “N-word,” West has repeatedly tried to reappropriate symbols associated with racial oppression into signs of black empowerment. The Confederate flag was featured prominently on merchandise and marketing for his Yeezus tour, for instance. In “Ye v. the People,” West articulated that this was the same idea behind his recent MAGA gear obsession: “I feel an obligation to show people new ideas—And if you wanna hear ’em, there go two right here: ‘Make America Great Again’ had a negative perception. I took it, wore it, rocked it, gave it a new direction.” Indeed, he recently paired a redesigned MAGA hat with a Colin Kaepernick sweatshirt! 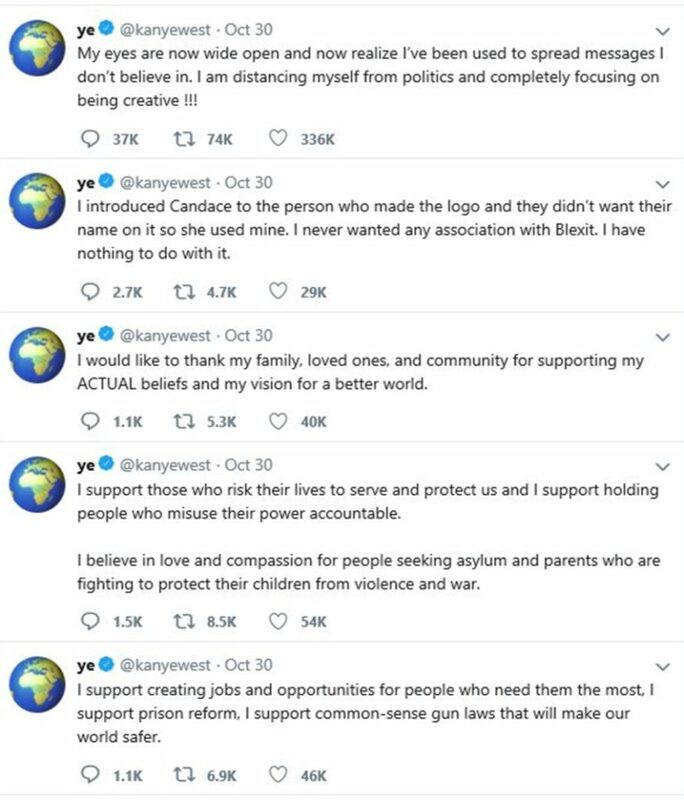 Yet West’s engagement with right-aligned political figures did not begin with Trump: In August 2015, Ye announced his intention to run for president in the 2020 cycle. Soon thereafter, he began talking with Republican presidential contender Ben Carson. The then presidential hopeful said he was “extremely impressed” by West. Ye, in turn, described Carson as “brilliant.” Yet by March 2016, Carson had ended his campaign for the presidency and endorsed the Donald (Carson currently serves in Trump’s administration as the secretary of Housing and Urban Development). This is was likely the beginning of Kanye’s journey to his “brother” D. J. Trump. In a now infamous concert shortly after the election, West talked about the need to transcend partisanship and pursue the best ideas regardless of where they come from. He also confessed that, over the course of the campaign, he’d grown increasingly impressed by Trump’s “non-political” means of communicating with his base. (He even anticipated Nassim Nicholas Taleb’s redefinition of rationality, declaring, “His approach was absolutely genius. Because it ****ing worked!”) In some senses, the affinity between Trump and West should not be surprising: linguist John McWhorter has argued that the Donald’s communication style and public persona is in many ways akin to that of a rapper—which may help explain why Trump was featured so prominently (and positively) in rap music throughout most of his public life. Kanye met with Trump prior to his inauguration, insisting, “It is important to have a direct line of communication with our future President if we truly want change.” Indeed, his wife used these lines of communication to help secure the release of Alice Johnson, a first-time nonviolent drug offender condemned to life in prison. Building on that success, Ye arranged an Oval Office meeting with the president to discuss criminal justice reform—an issue that has been at the heart of his work since day one. Despite the spectacle surrounding the public portion of their meeting, West apparently did have an impact in moving the President towards support for the first step Act. If the bill does get signed into law, it could improve the lives of many people of color. And they will have Kanye West to thank—at least in part—for its passage. In short, we are not seeing some new Kanye. If he seems new, it’s because people (especially media people) have short attention spans, or maybe they weren’t paying careful attention to begin with, or maybe because the milieu in which Kanye finds himself has shifted more than the fundamental dispositions of the man himself. Likely all of these are true to some extent, but it doesn’t change the falsity of prevailing narratives about some sudden shift in who West is or what he’s about. Because many in the media are starting from the premise that there has been some dramatic shift in West’s values and priorities, they have fumbled about for a way to explain the change. Many have attempted to write off Kanye’s embrace of the Right as a byproduct of mental illness. This tactic has a long pedigree: because most social scientists skew leftward, they have been permitted to create whole academic literatures essentially defining conservatism as a pathology. Yet, this mode of “analysis” is no less shameful or damaging for being so banal. If there were an award for the most disgraceful psychologizing of this nature, however, it would certainly go to Ta-Nehisi Coates. In his Atlantic column, “I’m Not Black, I’m Kanye,” Coates analogizes Ye to Michael Jackson and O. J. Simpson, claiming the three are united by a drive to enjoy their accrued fame, wealth, and privilege without being tied down or held back by others’ perceptions of blackness—nor by any sense of solidarity with (or obligation to) other blacks. Indeed, what all of them want most of all (in Coates’s telling), is to ingratiate themselves with whites, and be beloved in elite white circles. Michael Jackson bleached his skin, straightened his hair, got extensive plastic surgery, and even dressed himself in a fashion reminiscent of a white woman—apparently quite intentionally. O. J. Simpson tended to present himself in a manner consistent with his wealthy white peers: if one saw a Caucasian man dressed in the exact same outfit, and carrying himself in the exact same manner as O. J. Simpson, few would think anything of it. The same cannot be said of West. Indeed Kanye is literally blacker than O. J., M. J. (pre-whitewash), or even Coates himself: he is phenotypically a bit darker. This matters a lot in terms of how others—including other blacks—perceive and interact with him. This reality (colorism) has been pointed out by African American luminaries ranging from Clarence Thomas to Malcolm X, and is robustly established in social science literatures. No one would ever mistake Kanye for anything but a black man—and he leans into this existential situation when presenting himself to the world, including in his music. Yet, when he was under investigation for child molestation, M. J. suddenly got in touch with his blackness again—releasing a track called “D.S.,” in which he insinuated that Santa Barbara County District Attorney Tom Sneddon was “brothers with the KKK”—much like how “I’m Not Black, I’m O. J.” Simpson suddenly grew race conscious when being prosecuted for the murder of his white wife. 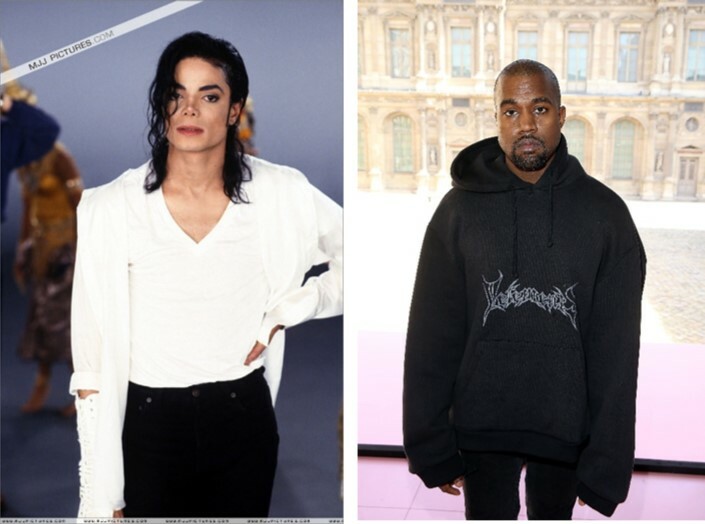 In stark contrast with these men, Kanye never had to rediscover the significance of his blackness: it is a prominent theme in every single album he’s released. For the sake of brevity, let’s just stick with the post–Kim Kardashian albums (i.e., after he went “Hollywood”): Yeezus, Life of Pablo, and Ye. The first includes a track sampling Billie Holiday’s “Strange Fruit”—a song about lynching—to explore the destructive consequences of adultery, unwanted pregnancies, and abortion (again, conservative themes). “Black Skinhead” includes lyrics like “Enter the kingdom, but watch who you bring home—they see a black man with a white woman at the top floor they gon’ come to kill King Kong. Middle America packed in, came to see me in my black skin. . . .” It’s hard to imagine Jacko spitting lyrics like that. In “Never Let Me Down,” Kanye raps in his debut album, “I get down for my grandfather who took my mama, made her sit in that seat, where white folks ain’t want us to eat. At the tender age of six she was arrested for the sit-ins. And with that in my blood, I was born to be different. Now n****s can’t make it to the ballot to choose leadership—but we can make it to Jacob’s and to the dealership.” He circled back to these same themes in his 2013 “New Slaves,” which begins: “My momma was raised in the era when clean water was only served to the fairer skin. Doing clothes you would have thought I had help, but they wasn’t satisfied unless I picked the cotton myself.” The song only gets more provocative from there, as Ye urges African Americans to break out of their slave mentality, even as he names and condemns the systems and institutions he perceives as enslaving them. It was released some five years ago but is, incidentally, probably Kanye’s most effective exploration of the themes evoked in his notorious slavery “sounds like a choice” and “abolish the Thirteenth Amendment” remarks (incidentally Colorado just became one of the first states to strike down the Thirteenth Amendment’s “exception clause” from their state constitution). At four minutes and sixteen seconds in length, one could listen to Ye’s track much faster than reading any of the pedantic bad-faith takes circulating in the media—and be much more edified thereby. Kanye concludes “Feedback Explicit” on his 2016 Life of Pablo with “Hands up, we just doing what the cops taught us. Hands up, hands up. Then the cops shot us.” In his 2004 debut he analogously stated, “I basically know now: we’ve been racially profiled, cuffed up and hosed down, pimped up and ho-ed down . . . we from the bottom so the top’s the only place to go now.” Pablo opens with “Ultralight Beam,” a track framed as a prayer, featuring a chorus throughout and closing with a benediction by gospel legend Kirk Franklin. 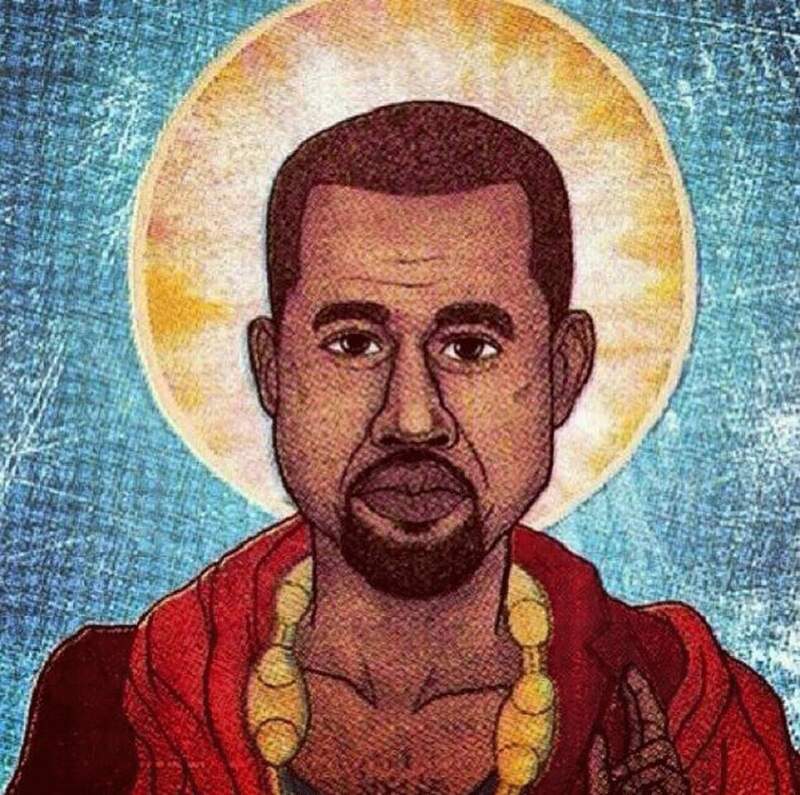 The song is a meditation on keeping faith in the face of despair—subversively harkening back to the “Jesus Walks” motifs that he launched his career with. West and Coates don’t differ greatly in their views about racism in America. They differ in their views about how to respond. Coates’ response is to essentially throw one’s hands up in resignation—cynical about whites’ capacities to change themselves, or blacks’ capacities to change or subvert the system. In contrast, while West also acknowledges the persistence and ubiquity of racism in its many forms, he does not believe we have to let that define who we are: We don’t have to give up in the face of oppression, inequality, and long odds. Nor do we have to succeed by giving the dominant culture what it wants and expects from black people. We don’t have to be like Coates, using race as our near exclusive lens of interpreting or talking about the world—calling out privilege in every interaction, evoking slavery and Jim Crow in every paragraph—as if that’s in any way a bold or dangerous stand to take among contemporary social elites (it is not), or as if there’s nothing more to us beyond our skin color. Coates has become, in his own self-description, the “guy white people evoke to show they know something.” Kanye West is many things, but at least he is not that. Indeed, Ye lives and works primarily in the “blue” bastions of New York City and Los Angeles, and operates in industries that skew even further Left (media, entertainment, tech, fashion). His political stand has made him something of a pariah in his personal and professional circles. Yet he took those positions, quite explicitly, to empower other black people who hold contrarian views but feel compelled to suppress them. The irony, of course, is that if Yeezy’s goal actually was to ingratiate himself with the whites he encounters on a daily basis in Manhattan or LA, he would have been much better off quoting Coates rather than embracing Donald Trump: Ta-Nehisi, thou doth protest too much. But not only is it curiously deflective to depict Kanye as a race-traitor, such an accusation also shows a lack of comprehension of what West is trying to achieve—and the scale of it. While some are fighting for scraps from the table, and others for a seat at the table, Kanye West is trying to take the whole damn table. He’s trying to seize the means of cultural production. He’s not denying his race, or trying to avoid its implications—he’s attempting to rewrite the terms of engagement, to change the background culture. This is why he regularly compares himself to people like Steve Jobs or Walt Disney. The fact that these pronouncements sound so ludicrous to us is in no small part because we can’t imagine a black person doing something like that, being someone like that. But Kanye doesn’t care. And what’s really crazy is the extent to which he’s already succeeding. Let’s start with music: here, Kanye’s genius must be conceded outright. But despite the subversiveness and complexity of what he does, there is also a certain elegance and accessibility, which has allowed him to become one of the most commercially successful recording artists of all time. He essentially created a whole new genre of black music and opened the door for a generation of black artists—people like The Weeknd, Chance the Rapper, Donald Glover, Drake, Frank Ocean, Kid Cudi—black men who can be playful, introspective, vulnerable, artistic, and who don’t have to appeal to the ghetto, violence, crime, poverty, etc. for credibility or authenticity. He runs a creative content company (donda) and also founded a record label (g.o.o.d. Music) to help extend opportunities to other promising and innovative (overwhelmingly black) up-and-coming musicians. On their own, these contributions would amount to an incredible legacy. But now let’s shift to his impact on the fashion world. West’s Yeezy apparel lines have received positive reviews from fashion critics on the red carpet. Commercially, West’s merchandise sales are almost as impressive as his music numbers: He scored a long-term contract with Adidas, and his lines typically sell out almost immediately after release. Professional athletes sport his gear on the court; celebrities rock them out on the street. But here again, Kanye is not just boosting Kanye. He has consistently called out the industry for its failure to hire and feature black designers, and the industry is actually changing in response to his critique and (perhaps more importantly) his success. West has proven that there is a market for products by black designers, and as a result, companies have taken to appointing other blacks to head major fashion lines in an unprecedented way. Now Kanye is moving to advance yet another of his longstanding interests—and invade yet another space where blacks have been rare and largely invisible—architecture and interior design. In May 2018, West announced the launch of Yeezy Home, a studio intended to bring together “architects and industrial designers who want to make the world better.” Their first priority? An affordable housing project that draws on many of the aesthetic themes that run through Ye’s music and fashion lines—described as “strangely genius” for its pragmatism. And once again, West is bringing up other people of color alongside him, most notably longtime collaborator, trained architect, and noted innovator Jalil Peraza. Who’s Afraid of Kanye West? In short, virtually every component of Coates’s narrative is blatantly false—but this didn’t stop his column from being shared more than 152,000 times on Facebook alone. Why are so many otherwise intelligent and reasonable people so eager to produce, proliferate, and endorse such transparently bad takes on Kanye West? Likely because a more sober reckoning is too disconcerting. For starters, Kanye’s ideological bearing is likely much closer to the average African American than that of most community spokespeople in the media or academia. It is a long-known but under-discussed fact that blacks are, on average, more socially conservative and religious than whites. The post-Kennedy alliance between African Americans and the Democratic Party was always a marriage of convenience rather than love: the DNC is perceived as the party that is more supportive (or less hostile) with regards to poverty assistance, civil rights, etc. But the danger is ever-present that African Americans, who typically represent roughly 20–25 percent of the Democratic coalition, might defect or simply disengage if the party comes to be seen as failing to hold up “their end of the bargain.” And this would be terminal for Democrats’ electoral prospects. In 2016, Donald Trump won the largest share of the black vote of any Republican since 2004; Hillary Clinton won the lowest share of the black vote for any Democratic candidate since the year 2000. Given the precarious state of the post-Obama Democratic coalition, it was a big deal when Kanye returned to public life in April 2018, after a months-long sabbatical, by declaring that he loves “how Candace Owens thinks”—and asserting that he and Trump share “dragon energy.” West then proceeded to hit the Democrats where they are most vulnerable: declaring that blacks have precious little to show for their unwavering allegiance to the party over the past several decades. Trump’s popularity among African Americans (particularly men) rapidly increased following Kanye’s critiques of the DNC, and to this day remains about 30 percent higher than its pre-Kanye baseline. There’s basically no left-aligned black media or academic personality (or even any combination of them) who seem to exert a comparable countervailing influence through their incessant critiques of Trump—certainly not the likes of Ta-Nehisi Coates or Don Lemon. It is precisely because Kanye is such a cultural force among ordinary black folk that so many in the media or academia view it as a priority to discredit him in a racialized way: their near-monopoly in defining the will and interests of African Americans for the dominant culture is being threatened; the nonrepresentative character of their opinions is being exposed. Meanwhile, those on the right ignore or downplay West’s consistent and continuing criticisms of inequality and institutionalized racism—attempting to reduce his agenda for black liberation into “Blexit” and nothing more. His next album, Yandhi, is set to drop (of course) on Black Friday. 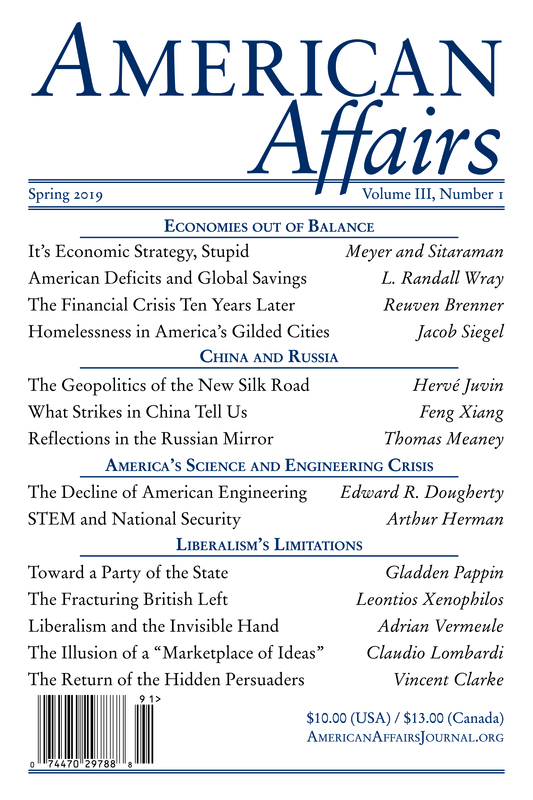 This article is an American Affairs online exclusive, published November 13, 2018. Musa al-Gharbi is a Paul F. Lazarsfeld Fellow in Sociology at Columbia University and a senior fellow at Heterodox Academy. Readers can connect to his work and social media via his website, musaalgharbi.com.